Fire extinguishers use two methods to expel the agent onto the fire. Stored Pressure and Cartridge Operated. 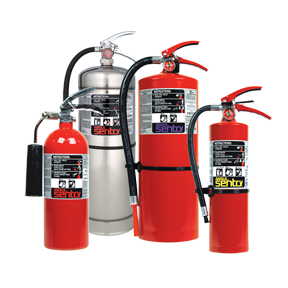 Stored pressure fire extinguishers are easily the most common type. In these units, the expellant is stored in the same cylinder as the agent itself. The different agents used in the fire extinguisher may require different propellants. Dry chemical extinguishers typically use nitrogen or dry air as a means of propelling the agent onto the fire. Water and foam extinguishers typically use air. ABC Dry Chemical – Reliable Fire & Security recommends ABC dry chemical extinguishers that can be used for many common fires. BC Dry Chemical– Suitable for use on flammable liquids and energized electrical equipment. Foam which is recommended for use on Class A combustibles and Class B flammable liquids. Clean Agent extinguishers contain various environmentally friendly, non-residue forming chemicals well-suited for flammable liquids and energized electrical equipment. Carbon Dioxide (CO2) Extinguishers are used for class B flammable liquids fires as well as Class C Electrical fires. Pressurized Water – used for Class A fires only. Water Mist is a useful extinguisher for Class A fires and where a potential Class C (electrical) hazard exists.